The Mt. Blue graduate is getting lots of playing time for the Mustangs, averaging 15 points per game. Gabby Foy’s decision to attend Central Maine Community College wasn’t entirely about the school’s success on the basketball court in recent years. Foy hasn’t had to worry about a lack of playing time this season. She started 25 games a freshman for a CMCC team that is 26-2 and is the No. 1 seed when the United States Collegiate Athletic Association tournament begins Thursday in Uniontown, Pa.
Foy, a Wilton native and Mt. Blue High School graduate, has done her part to get the Mustangs to this point. She’s second on the team with 15.0 points per game (in only 23 minutes per outing, because CMCC has a deep bench and plays a lot of blowouts). Foy is also averaging 3.8 rebounds, 2.1 steals, and 2.0 assists. “We thought that she could be a high-impact player at this level, and she certainly has come through on that end for us,” CMCC coach Andrew Morong said. Morong feels one of Foy’s best assets to the team is that she understands the value of it. “To be honest,” Morong said, “I think sometimes when people think of going to a community college, they see it as not a real college experience, and the athletics aren’t that good, (like) it’s maybe a step between Division III and high school. Foy, a 5-foot-6 guard, said the family atmosphere is a big part of why she enjoys the school, but she also like the success and the support from Morong and athletic director/men’s basketball coach Dave Gonyea. The style CMCC plays must be pretty nice as well. The Mustangs take nearly 80 shots per game, and about one out of every 10 are 3-pointers by Foy. Foy has made 73 3-pointers this season, which is second most in the USCAA Division II. That was news to her when a reporter mentioned it on Twitter last week. Morong watched Foy play in high school and AAU ball, and felt she didn’t get enough credit for being an all-around player. 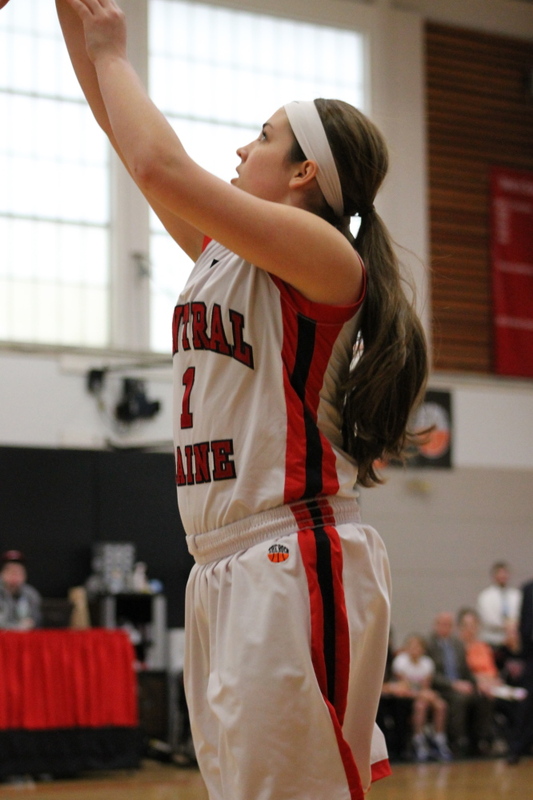 She’s at 82.8 percent on her free throws this winter, which is the best on the Mustangs. Foy feels the Mustangs are deep enough to sub five in at a time and not lose anything on the court. She’s also optimistic they can play well in Pennsylvania.